Simplicity and support - learning to learn from experience with Joe Weiler . Client Support Executive Joe Weiler advocates simplicity, for everything from travelling the world to the support he offers to our customers. “I draw from simplicity during my working day by creating To Do lists with all my tasks - long term and short term - so I can see how my week will pan our (or at least is planned to pan out)! ” Weiler says. "I utilise simplicity outside of work by only taking hand luggage when travelling abroad. Having that restriction of only bringing both what I really need and what I can carry makes moving around any country a lot easier. It's always fun skipping the queues at hold luggage carousels!" Joe's ongoing projects include; helping City & Guilds Group Customers get set up with Assured ( The City & Guilds training accreditation service) and staying up to date with the latest developments on the Credly platform , this means understanding how new features change the experience customers and the individuals who receive credentials have. We sat down with Joe at the Digitalme Office in Leeds, to learn more about his history of working with badges then credentials and his approach to supporting customers with their programmes. Q: When did you get started working with Digital Credential? I think it was in 2012 when Open Badges first arrived on the Makewaves platform. We worked on a programme called Supporter to Reporter around the 2012 Olympics, and that project introduced the first badges to Makewaves. The tasks were designed to encourage young people to document what was going on around them during the Olympics by reporting on sports activities in their area, taking part helped them develop digital, speaking and listening skills - as well as highlighting some of the sports stars of the future - I remember there was actually an interview with Tom Daley back before he was at the Olympics, he must have been about 14 at the time, so there was some amazing opportunities there and kids had digital badges to show their achievements afterwards. It was then interesting to try and translate the programme to our audience at the time, which was mainly primary schools. Kids like collecting things so they saw that as a new challenge and when we launched a new set of badges they wanted to find out how they can catch them all immediately, so that was good to see how well it took off. What was the most interesting badge programme you’ve worked on? 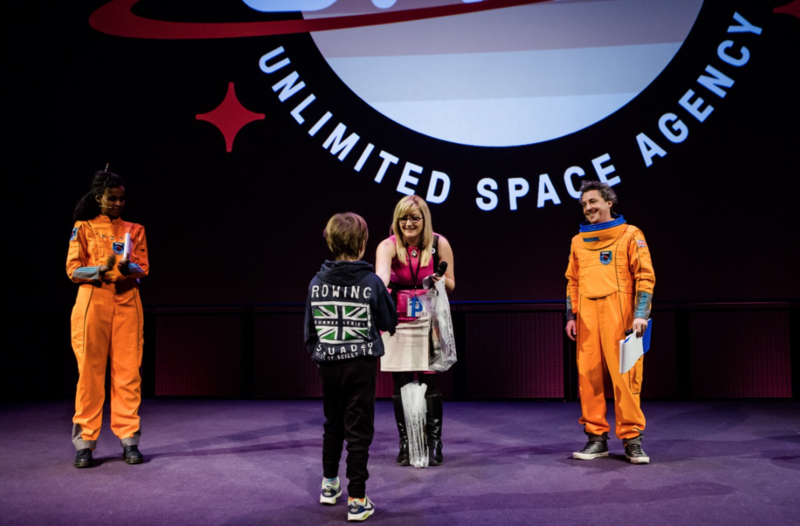 The best badge programme I have worked on was probably The Astro Space Challenge with the Unlimited Space Agency (UNSA) in Autumn 2015, it was the run up to Tim Peake’s Space launch. UNSA and their partners offer a free interactive, space science adventure for children aged 7-11 to inspire them in STEM subjects - their mission is to help train the next generation of young scientists. This mission was translated into six badges for the young cadets to complete. The tasks were influenced by Tim's own expedition training. When they had completed the tasks, they earned a badge - in the end we had something like 13,000 badges issued. The absolute pinnacle was going to London on the day of the launch at the Science Museum I was invited to watch it in the IMAX screen there with a bunch of really excited kids that had taken part in the project - the BBC were there, but in a little corridor with a little TV, and we had the big IMAX screen, so that was quite fun. Just seeing kids engage with those experiences they might not have had access to through badges and some of the amazing work they did, that was brilliant to see. What do you think enabled the project to award so many badges to so many learners? It’s open to anyone, and that’s attractive to those who might be home-schooled, as kids that aren’t in the traditional education system, I guess are often overlooked for opportunities such as this, but they were actually some of the most creative participants and for them getting to take part at the end in the big event with all the other school kids was really great, and shows how inclusive it was. I think its success is down to the quality of the whole prgramme and the resource that was put into it. The programme and tasks were written by a theatre company, so they put together an amazing story and a hell of a lot resource went into it to the experience in terms of its design and management over the six weeks, having a story running through the programme was engaging and I think the results were a tribute to the people that put a lot of work in to make it happen. The Astro Science Challenge is now an app, so children could take part in activities anytime. What was the story about, and how did it engage the learners? 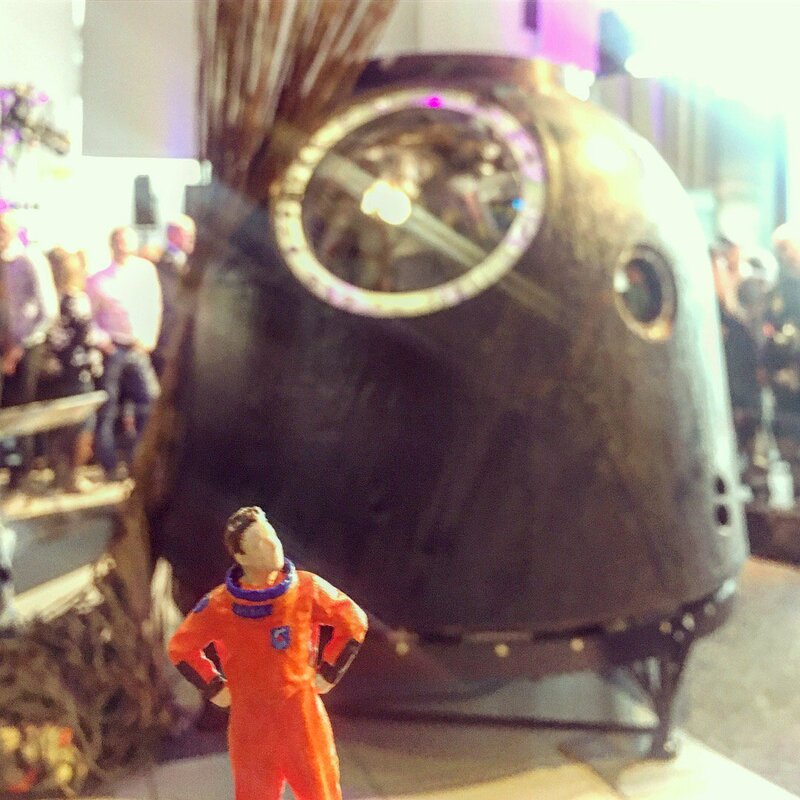 There was a character called mini Jon, that they could all talk to and interact with and there was even a mini John figure that actually made it to the space station and was actually taken on board and brought back again, so it was really interactive during that time period, which a lot of kids weren’t expecting but they got really excited when they could speak to someone that was going through the missions at the same time as them. And all the kids had to rally behind him - their comments on the post would say things like “No, No, You’ve done so much, you’ve come so far.” and that helped him get the confidence to get back into training again - it really tugs at the emotions, but it added another element and created a well-rounded learning experience. We all need a little support, and implementing a new digital element to your learning programme can be daunting for the most tech-savvy individual. So in your experience, what do the most engaging programmes have in common? It’s got to be captivating for one, it’s got to be a good story and experience that people want to engage with. It needs the resource behind it, obviously, not everyone can hire a theatre company to run your programme for six weeks but you do need somebody to sort of make sure the tasks are clear enough for someone to do and also have a support system in place to help people whenever it’s not so clear. The supporting activities are well written. For UNSA, the tasks all had an overarching goal - to help Tim get into space, which is quite a big task to have, but if you break down the goal, and make each step realistic, I think that will also help people engage with it, because if people see something and they think “Oh, I could never do that.” it can put them off moving forwards with the programme. They aim for an inclusive experience and use a great variety of support resources to achieve that. With that being said, it’s not always a lack of self-confidence that hinders engagement, sometimes its more about the interaction with your content. “Oh, I can't do that because a link is missing., or I don't know what to do next." maybe it just comes from my experience of working with badges over the years but even if I’m not involved in the programme itself I can often see the reasons why people are going astray. For example if a task is telling you to click here when it’s not actually a link — people are clicking where it says ‘click here’ that makes sense, but if following the instructions doesn't work - that’s going to baffle people. I think being realistic from the beginning about what support you need in place to create the best possible learning experience that includes credentials is key, mapping out the learning journey and co-developing and testing badges with the people who you want to earn them can give you some great insights to creating badges of value and an experience that makes a lasting impression for the right reasons. It also helps to think about the content you have to support learners related to the activities that you've developed - general FAQ's about your programme are always useful and working with the people who know the programme content inside out to make these accessible for individuals at any time is essential - you never know when they have some time to complete the set activities and earn a badge, from experience picking up the support tickets it's not often during working hours! How do you support customers to create better experiences? When you're involved with support, we are always looking for ways to improve the experience - by using data from support requests we feedback trends and suggestions to the people managing the programme to help them improve the experience, and fix an issue at the source saving their own and the badge earners time. For example if I see a high level of support tickets coming in from a certain badge or activity, I’ll pass those insights on to whoever is responsible for setting that programme up to try and help them smooth it out. Most tickets can be dealt with quickly, I have the resources on hand to either move that account to the right place or tell them where they might be going wrong. On the off chance it require more of a development based conversation, all of these people can be contacted online so you don’t have to be physically near someone to say - can you fix this? So - everything can be accessed and people can be helped anywhere so that’s good! Would you agree the key elements to a great programme inlcude engaging learning content, well written activities and a wide variety of support resources? If not, how do you support learning? If you'd like to find out more about how Digitalme are supporting digital credential programmes across Europe, get in touch.